Over Scotch and Cigars, These Entrepreneurs Created a Movement to Inspire Thousands. My father (not an entrepreneur) has always modeled "random acts of kindness" in his daily life, paying tolls for the car behind him, or paying forward any goodness he has received. Successful startup ecosystems that I have lived or worked in like Boulder/Denver/Fort Collins and Phoenix, have been built around Brad Feld's "give first" concept popularized in his book Startup Communities. However, the most scalable and living example of the truth that generosity works, is #yesphx. This week between 6,000-7,000 attendees will come through the 3rd annual Phoenix Startup Week (February 20-24th) and experience the #yesphx ethos of being "The world's most generous community for entrepreneurs" first hand. The #yesphx community/movement was formed in 2014 following a casual cigar and scotch gathering between Jonathan Cottrell, Mario Martinez, Dirk Beth, and Stephen Grutzius discussing the needs of the ecosystem, and has exploded in activity and impact ever since. It has attracted and serves a diverse group of entrepreneurs across the valley of the sun from tech, life science, minority-owned businesses. In a phone interview with Mario Martinez, (who has funded 100 angel investments since 2014 with 15 of them having their home base in Arizona), he said "The single most important thing we can solve as an ecosystem is quality. High quality entrepreneurs and their startups producing real results and value is the ultimate magnet to more talent and capital. #yesphx and StartupAZ are mechanisms to increase quality." Why generosity works is a paradigm as old as time, but how it works is even more interesting, as an entrepreneur focused on growth. The proof is in the results which continue to compound as Steve Case's Rise of the Rest took notice and selected Phoenix as one of the 5 cities to visit. Here are the "4" ideas to steal from #yesphx and implement into your business immediately to spark new growth. Right on their homepage it says "#yesphx is a unifying banner for Arizona's diverse startup ecosystem, 100% community-owned, bootstrapped, and yours to help lead." As the owner you are responsible for the health and overall organizational success, but you must share the accountability of your company's viability with each and every team member publicly and openly. Regardless of who is on your cap table, each member of your organization should feel as though they own a shared duty to your purpose. By embedding generosity in your DNA, you make it easy for everyone to align personal contribution and connection (ownership) to the organization. StartupAZ is a core pillar of their efforts enabling all new and existing companies in the ecosystem to pledge one percent (#Pledge1percent)of their stock to the foundation so that upon successful exits or liquidity events capital is directed back into the community to foster sustainable growth of new ideas and entrepreneurs. What programs do you have in place to regenerate growth, talent, etc.? Ideas include your hiring, mentorship, apprenticeship model for new talent and recruitment. Other ideas include how you can offset extractive supply chain processes with sustainable practices in your community. 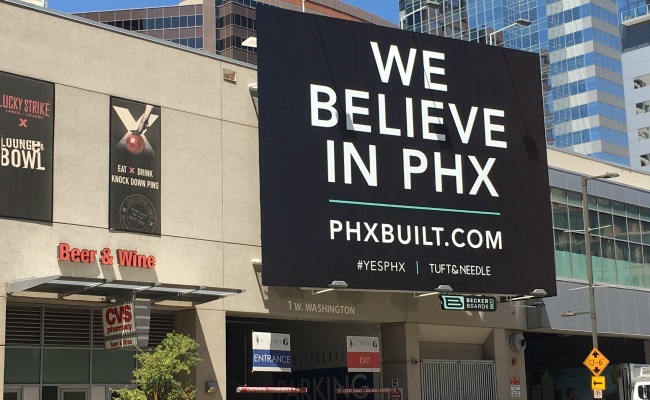 Tuft and Needle has sponsored pitch battles with cash and spends money on billboards along the Interstate 10 and 17 freeways that say "We Believe in PHX" as cool ways that a fast growing startup in the community can perpetuate the #yesphx mantra. JP Morgan Chase announced grants in excess of $925,000 this year for organizations promoting and enabling women entrepreneurial activity in the Valley. Much gathers more. The lesson: Catch people doing the right thing and promote it high and wide from the mountaintop. More will follow. Everything doesn't have to map back to strategy when it comes to being generous, but it should map back to your purpose. #yesphx has a clearly stated purpose of being the world's most generous community for entrepreneurs. When you have a clear directive ("worlds most generous community") that is crystal clear on who it serves ("for entrepreneurs"), you have a focused endgame, with freedom and flexibility to contribute in innumerable ways. How clear is your company's stated purpose? Does it allow for and promote creative generosity amongst your employment base? If it is time for a refresh, you can start by simply connecting yourself and your core leadership back to the "why" your business exists and "why" each of you loves to jump out of bed every morning to suit up for battle. Take action today and be generous.